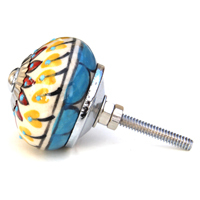 All our spherical shaped knobs, and most of our melon shaped knobs, can be fitted to our wooden door stops. If there is a design of knob that you would like to have on our wooden door stops, that is not shown here, please just add a note to your order and we will do our best to make it fit! Or please contact us at info@knobbelsandbobbles.com or on 07746 357625.